Coed Craig Ruperra has a long and to some extent hidden history. 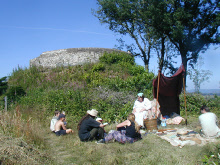 Its earliest known use by Man is the Iron Age Hill Fort which surmounts the ridge. The banks and ditches of this Scheduled Ancient Monument (which is registered by Cadw) are still just about visible under the thick overgrowth of Cherry Laurel, Rhododendron and Bracken, but the most obvious feature is the Motte, at the top of a steep-sided earth bank. This would probably have been a defensive look-out point, with its superb and commanding views over the surrounding countryside. Later use of the woodland would lead to the plantings which now cause us so much of a problem; the Morgans, the owners of Ruperra Castle from the early 17th century, planted exotic trees and shrubs on the southern slopes above the castle as an extension of their gardens. When they abandoned it in the 1930s, the now-uncontrolled shrubs soon took a foothold and began their rampage across the site. The Motte is surmounted by an eighteenth century enclosure for a summerhouse which was used until early in the twentieth century. After a long period of disuse, the feature was so overgrown that it was hard to imagine how it must have looked, and no views remained. In 2001, the Trust began its restoration project by removing the vegetation. 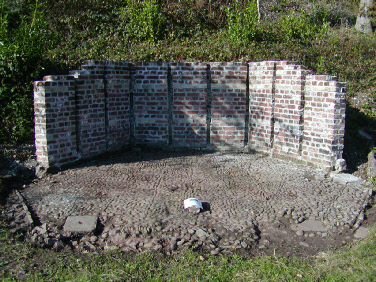 After several years, the work on the wall which is now all that is visible of the various structures began, with funding from Cadw, the Heritage Lottery Fund and Cydcoed, and the repair was finally completed in 2006. 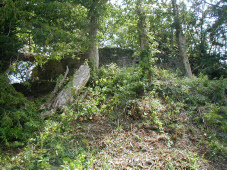 A smaller summerhouse has also been uncovered on the path leading from a gateway in the old castle wall; this has been partly restored and is listed by Cadw. Both the Motte and the Hill Fort are part of what would have been a walk from Ruperra Castle gardens. Along the way, other feaures included the ‘Lights’, five clearings cut through the trees above the Castle to afford the walker a view of the parkland and the landscape beyond. These, and an Arbour (probably a Yew hedge with a bench) are not well documented but the Trust has restored one Light and placed a large Arbour of green oak above it so that the weary walker can rest and take in the fabulous views. 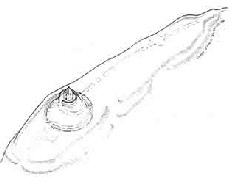 The earliest evidence of settlement at Ruperra is from between around 700 BC and 100 AD, when an Iron Age Hill Fort was constructed along the ridge of Coed Craig Ruperra. 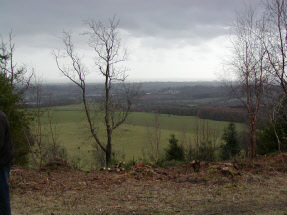 The splendid panoramic views from the top of the ridge would have given the site a strategically strong position. Defensive banks and ditches are still visible around the area of the mound, and continuing work on the site will reveal these more clearly. This hill fort lies within what would have been the tribal territory of a people the Romans called the Silures, who were a fiercely independent nation inhabiting the vale of Glamorgan, Gwent and the valleys. The Roman historian Tacitus describes them as short, dark, curly-haired people more like those of North Africa than other Britons. 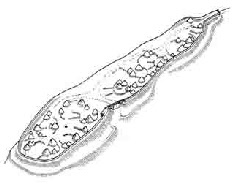 This has led some to theorise they may have been descendants of the ancient, pre-Celtic people of Britain. About 1100 AD a huge heap of earth for a Norman type motte or castle was piled up on the top of the ridge. On the top of the motte a wooden castle would have stood, ensuring a good defensive outlook over the surrounding countryside. The castle, of which nothing remains, is thought to have been part of the Norman takeover of south east Wales, falling into disuse once Caerphilly Castle was built in 1274. There is also a theory that the Welsh could have built the wooden castle to stop the Norman takeover. It is one of three local mottes, the others being the original Castell Coch and Castell Morgraig (the ruins of the latter are located behind the Traveller’s Rest pub on Caerphilly mountain). 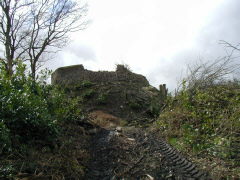 The worst of the thick undergrowth of bramble and laurel covering the mound in 2000 has now been cleared and the Trust restored the walls surrounding the top of the mound in 2006 with funding from the Heritage Lottery Fund, Cadw and Cydcoed. An investigation of the surface has uncovered some interesting remains and evidence of mediaeval occupation has been found. The next task is to clear the whole area of the Iron Age Hill Fort to show the defensive banks and ditches, currently cloaked in overgrowth for most of the year. When you stand on top of the mound admiring the splendid panoramic views, it’s easy to see the strategic defensive position that Craig Ruperra must have held throughout the centuries. An intriguing article in Country Life in 1986 [Oct. 23 pp 1277-9] quotes a letter of one Rev. W Watkins ca. 1762, in which is recorded the bizarre discovery of an erect skeleton in a room 2.5m square during the digging of the foundations of a summerhouse at Ruperra. [Catalogue of MSS Relating to Wales in the British Museum, ed. Edward Owen (1922), IV p.847]. It has been speculated that this could be the skeleton of a certain Cadwgan, born around 1430, who was reputed to be an illegitimate son of Gwilym of Ruperra. Little is known of this person, apart from a reference by the antiquary George T Clark in his 1886 work on Welsh geneaology, Limbus Patrum Morganiae et Glamorganiae to the effect that ‘Cadwgan built and died in the tower long called after him at Rhiwperra’. Other than this reference, there is very little written about the fate of the ridge from mediaeval times onwards, until an estate plan of 1764 describes a two storey summerhouse situated on the top of Craig Ruperra. This may have been built at the same time as the castle, more than a century earlier. The woods had not been wholly given over to the leisure pursuits of the rich, however – references in records to a “Ruperra woodyard”, and to coppicing and charcoal burning in the woods from the 16th – 18th centuries, show that it was also very much a working environment. Adjoining Coed Craig Ruperra at the south-eastern end is a field where in July 2004, a geophysical resistivity survey was carried out to see if any traces of the site of an old chapel could be found. The survey results tentatively suggested not only the chapel but several buildings grouped around a central space which would indicate a great deal of agricultural activity probably during Norman times. Finally, much of the Ruperra and Draethen woods were planted as softwood coniferous plantation from at least the time of the First World War: some of the conifers remain at Ruperra, but since 2000, the Trust has been working to regenerate the native broadleaved woodland. Geological map of Craig Ruperra area. At 182m (591 feet) above sea level, the summit of Craig Ruperra provides a wonderful view of the surrounding country, south towards the River Severn and north into the hills and valleys around Machen. It is a great spot from which to see how different kinds of rock affect the shape of the land. The rocks here are all sedimentary rocks, rock layers deposited under water, either under the sea, or laid down by rivers. 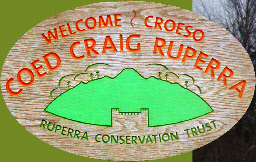 Craig Ruperra is situated on the southeastern rim of the South Wales Coalfield which stretches north to Merthyr Tydfil and west to Llanelli and Kidwelly. The coalfield rocks, which are about 300 million years old, are bent into a downfold, with rock layers on the northern rim sloping gently southwards and those on the south rim sloping more steeply northwards. The southern rim is marked by several parallel ridges of hard sedimentary rocks like sandstone and limestone, separated by parallel valleys of softer rocks like mudstone. Craig Ruperra is formed of a series of hard reddish sandstones called the Brownstones Formation. You can see these rocks sloping northwards at about 25o from the horizontal at the side of the track which leads up to the summit of Craig Ruperra from the west. The Brownstones lie underneath most of the reserve. 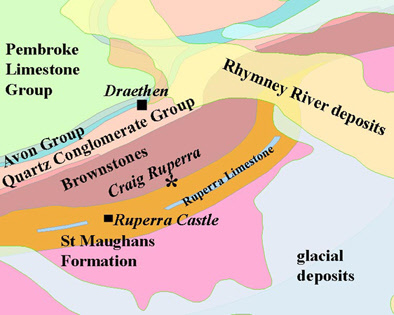 The Brownstones Formation forms a prominent ridge around the South Wales Coalfield. It continues west from here as the forested ridge of Coed Coesau-whips to Craig Llysfaen, Craig Llanishen and Coed y Wenallt. It is why Caerphilly Road rises steeply from Thornhill to the Travellers’ Rest. Northeast from Craig Ruperra, the Brownstones continue on the other side of the Rhymney River as the wooded slope of Graig Wyllt above Plas Machen. These rocks then run north past Cwmbran to form the slopes of the Blorenge overlooking Abergavenny, as well as the slopes of the Black Mountains. They even form the Brecon Beacons. The rocks of Pen y Fan are formed of the same rocks as Craig Ruperra, although the Brownstones are much thicker in the Brecon area than they are here. The Brownstones are part of a sequence of mainly reddish-coloured rocks deposited by rivers flowing southwards from high mountains across a wide coastal plain about 400 million years ago during the period of time known as the Devonian. Collectively these rocks are called the Old Red Sandstone. Craig Ruperra falls away steeply on its southeastern side because beneath the Brownstones is a sequence of mainly soft rocks like mudstones, which, along with the Brownstones, belong to the lower part of the Old Red Sandstone. The St Maughans Formation, and the Raglan Mudstone Formation which lies beneath it, form all of the lower ground from here southwards towards the River Severn. 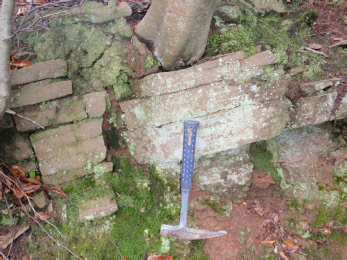 Occasional harder sandstone beds within the mudstones form low ridges such as at Cefn Mably. Most of this lower ground is also covered with rock debris, called boulder clay or till, dumped by ice during the last glaciation, about 20,000 years ago. Near the top of the St Maughans Formation is a thin bed of grey limestone known as the Ruperra Limestone. The outcrop of this rock runs close to, parallel with, and just within the southeastern boundary of the reserve and also just to the west of Ruperra Castle. The limestone was formed by limy nodules growing in the soil in the hot semi-arid climate of South Wales about 400 million years ago. The limestone was quarried locally for agricultural lime. The northern slopes of Craig Ruperra are also underlain by the Brownstones Formation, but towards Draethen, the steep slope which descends down to the valley of Nant y Draethen is formed of rocks which lie on top of the Brownstones. These are again mainly sandstones, but this time more yellow or green in colour, and with some bands of coarser pebbly rocks. They are known as the Quartz Conglomerate Group and they belong to the upper part of the Old Red Sandstone. The same rocks occur on the Blorenge and cap the summit of the Sugar Loaf above Abergavenny. Looking west from the summit of Craig Ruperra, you can see the steep, narrow valley of Nant y Draethen. This valley has been eroded along the outcrop of some softer rocks which lie above the Old Red Sandstone, although the stream itself runs on rocks close to the top of the Quartz Conglomerate Group. The geology changes here from sandstone to limestone. The limestone sequence belongs to the next, younger, period of geological time, the Carboniferous. The deposits begin with thin limestones (the Castell Coch Limestone Formation) and soft mudstones (the Cwmyniscoy Mudstone Formation) and these have been readily eroded by the stream to form the valley. This is an exceptionally good example of a valley eroded along the outcrop of a particular rock unit, a feature known as a strike valley. The limestones mark a change in the environment of South Wales. The rivers and coastal plain of the Devonian Period was flooded by the sea and South Wales became a shallow tropical sea. The northern side of the valley rises just as steeply as the southern side as the softer rocks give way to a sequence of hard limestones known as the Pembroke Limestone Group. These limestones form another prominent ridge around the edge of the South Wales Coalfield. Farther west, at Taff’s Well, they form the ridge on which Castell Coch is built as well as the Lesser Garth on the western side of the Taff where there is a large quarry. The limestone is quarried all along its outcrop and from Craig Ruperra you can see quarries at Cwm Leyshon on the edge of the ridge to the west and to the northeast at the long, narrow Machen Quarry. To the left (north) of Machen Quarry, the dip in the skyline is formed of the coal-bearing rocks and then rises to coal-tip covered Mynydd Machen which is made of hard sandstones. These sandstones also form the distant hills you can see to the west, beyond the limestone ridge. The coal and sandstone marks another change in the environment of South Wales, as the shallow seas silted up and became humid equatorial swamps. Next time you’re struggling up the path to the motte at the summit of the ridge, you’ll know you can blame the geology! Although a portion of Coed Craig Ruperra formed part of the formal gardens for Ruperra Castle, the work Ruperra Conservation Trust performs does not cover the castle. The castle currently belongs to a private owner, whilst the charity, Ruperra Castle Preservation Trust, is actively trying to protect the remains. However as the two sites are so closely connected we have given a brief history of the castle below. Still visible on the motte are the remains of a later summerhouse consisting of three sides of octagonal sandstone kerbing with pitched pebble flooring and an inner area surfaced with calcite chippings. This is known to have been a wooden structure which was open to the south and was set inside the footings of the earlier building. 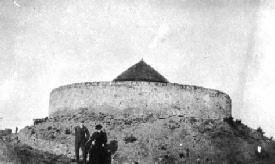 A photograph taken around 1918 to 1920, probably from the west, shows just the roof of the summerhouse from below the mound (see picture in Overview above). Some local residents and soldiers from the war years still remember the building with its thatched roof intact and recall that the walls were constructed of split logs and open on one side (presumably the south) and that there were seats going around the inside. There was also a little white wooden gate at the top of the spiral path up to the summit. No trace of the wooden walls, roof or seats of the summerhouse have survived although blacksmith-forged iron nails, clay pipe stems and some small pot-shards dating from that time have been found scattered over the site. 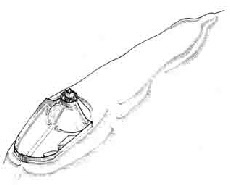 Some more ‘modern’ oval iron nails made by the drawn wire method may indicate later 20th century repairs. 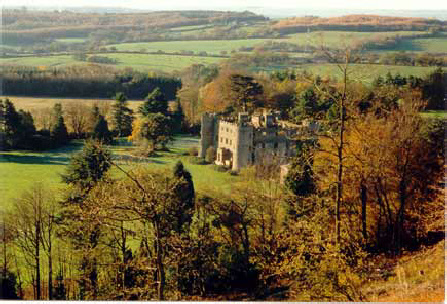 Ruperra Castle was built by Sir Thomas Morgan, who, as Surveyor of the Wood to King James I, had been knighted in 1623. As steward to the Earl of Pembroke, he would have been one of the most powerful men in Wales at that time. The revenue he gained from these occupations, and from having made a favourable marriage, enabled him to complete the building of his house at Ruperra in 1626, probably on the site of an earlier mediaeval house. During a visit to the castle in 1684 Thomas Dineley, an artist in the service of the Duke of Beaufort, made a famous sketch of the south elevation and mentioned the 'majesty of the old oaks' and the 'proud park of deer'. 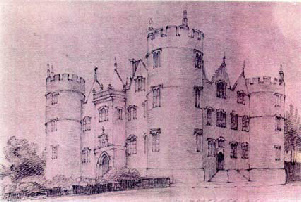 A century later Ruperra Castle was destroyed by fire. 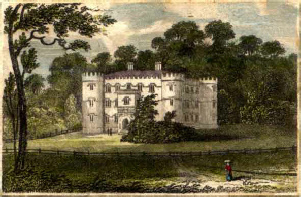 The architect Thomas Hardwicke was employed to rebuild it and the earlier gables were replaced by flat battlements, depicted in an engraving by J P Neale in 1820. The antiquary Benjamin Malkin described as 'singularly beautiful' the effect of the harvest moon shining on the Bristol Channel as he walked across the park. New lodges, namely Ruperra Park Lodge, East Lodge and West Lodge and Ironbridge Cottage were built around the castle in the Victorian era. The Iron Bridge, now listed, and recently restored by Newport County Borough Council, had been built in 1826 to take the new carriage-way from the castle through Coed Craig Ruperra and across the Rhymney river to Lower Machen church, where the family and their servants attended Sunday services. This route can be partially followed alongside the public footpath accessed from the Draethen-Michaelston road, leading past Ironbridge Cottage over the bridge to Lower Machen and Draethen. By 1900 the buildings at Ruperra were in need of repair with the stable block already having been destroyed by fire in 1895. After the death of Colonel Frederick Morgan in 1909, his son Courtenay embarked on a programme of refurbishment to include a new east entrance porch, new stables, a new power house fitted with duplicate steam-driven generators, dynamos and boilers and a new reservoir and pump house in the deer park. The brew house, laundry and dairy range, built in the 1840s, were converted to accommodate the valets, footmen, chauffeurs and garden staff. In spite of the splendid building works, Ruperra was now very much only the second home of the Morgan family, who lived mainly at Tredegar House in Newport. With only a small domestic staff installed, Ruperra Castle was used instead for hunting and shooting and weekend parties. 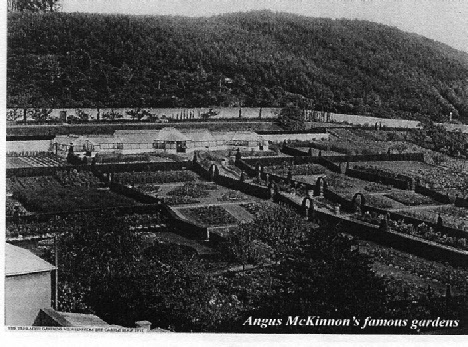 Even so, the gardens were maintained to a high order, with Mr Angus McKinnon heading a large staff, with his wife Agnes supervising the domestic arrangements. By 1935 the fortunes of the Morgan family had declined and the 3000-acre estate was put up for sale. However, there were no offers, and the contents of the castle were disposed of in a three day sale. What remained was taken to Tredegar House; the castle was abandoned and the gardens left to go wild. 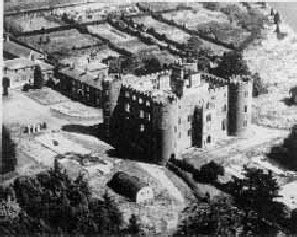 With the outbreak of World War Two, Ruperra Castle was requisitioned and from 1939 to 1946 a succession of Royal Army regiments - Signals, Mobile Bakery, Searchlights, Medical Corps –and a variety of troops including Indians and Dutchmen, were sent to Ruperra to be trained and moved on. At the end came German prisoners of war. 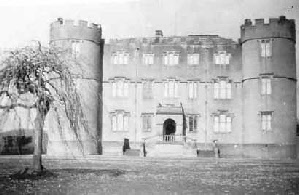 On December 6th 1941, when a British regiment of Searchlights were in occupation, a large fire broke out in the castle, caused by faulty electric wiring. Flames were visible for miles around, but in spite of the number of fire engines attending, the castle was gutted by the fire. 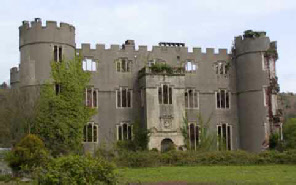 In 1956, the whole of the Tredegar estates of 53,000 acres were sold off, including the now ruined castle of Ruperra. The castle has remained in private ownership since then. In 1982, the south-eastern tower collapsed, and there are large cracks in the other three. To date, no suitable plan for its restoration has been approved despite the efforts of local people and Ruperra Castle Preservation Trust to ensure its survival. It is Grade Two* listed by Cadw and is also a Scheduled Ancient Monument. The first Sir Thomas enlarged the 16th century deer park at Ruperra and there were still deer on the park at the beginning of the 20th century. 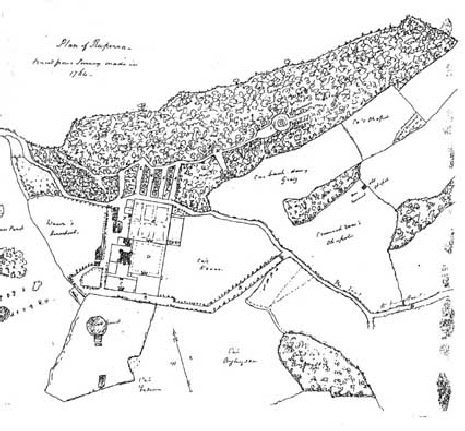 The 1764 estate map shows a formal landscape style which may date from a century earlier, with 'lights' (clearings through the trees) and terraces. The remains of those historic terraces may still be present. In 1699, William Winde, the famous gardener, records in a letter to Lady Bridgeman, that he had moved trees of ‘considerable bigeness withe good suckcess’ at Ruperra. By the end of the 18th century, the new informal style had taken over. The 'lights' disappeared and the enclosing structures in the castle grounds were removed. The formal gardens became lawns and were enclosed by a curved fence. The splendid Edwardian gardens, contemporary with the building works of Courtenay Morgan, are still remembered today, as is the head gardener, Angus McKinnon, whose grave is in Lower Machen churchyard. The listed glasshouse, the only one in Wales built by the famous Mackenzie and Moncur of Edinburgh, has survived since 1913 in amazingly good condition, half hidden now by thick brambles. After the end of the war the gardens and parklands were left to return to nature. While the Castle grounds are in private hands and inaccessible to the public, there are magnificent views from the Motte Path on the woodland of the remains of this romantic ruin. It remains an important part of the history of Coed Craig Ruperra. 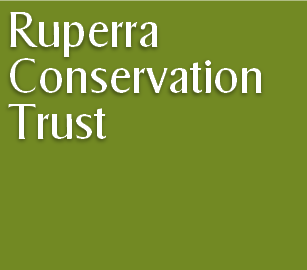 Ruperra Conservation Trust is committed to resurrecting or conserving the historic features of the landscaped gardens in the woodland where practicable, e.g. 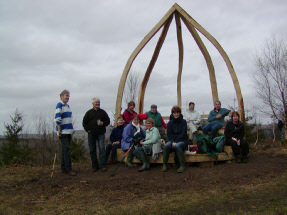 by building a new arbour on the site of a previous one marked on the 18th century estate map. This approach is at all times constrained by the need to ensure that any such work undertaken does not risk adversely affecting the wildlife on site. Where possible, interpretation boards (funded by the Heritage Lottery Fund, Cadw and Cydcoed) have been erected to give the visitor an idea of how the site would have looked during the various stages of its long history. The future of the Castle is uncertain, but for more information on the campaign to secure its future, visit the website of Ruperra Castle Preservation Trust . Further up the ridge, if you climb the spiral ramp to the top of the motte, you will find yourself standing on the very substantial and impressive footings of what would have been, two and a half centuries ago, a six metre square tower with walls just under a metre thick, which are presumed to be the foundations of the first summerhouse on the mound shown in a 1764 estate map of Ruperra. They would have easily supported the two-storey stone building described. An area of a superstructure, probably a fireplace, laid on these foundations was constructed of bricks and mortar similar in fabric, size and composition to those used in Ruperra Castle itself and this suggests that the first summerhouse was built in the 17th rather than the 18th century. Some surviving plasterwork indicates a doorway in the south wall. The stone roof tiles and the blue-green window glass found around the mound must be from this structure. The estate map of 1764 describes the walls surrounding the summerhouse as having been built ‘sometime in the last century’, which adds to the puzzle of determining when the summerhouse was actually built. Nothing of the early structure remained by the end of the 19th century: it may have been used to fill the ditch on the eastern side when the later wooden structure was erected. 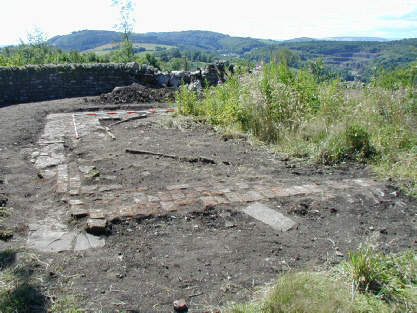 Some of the bricks may also have been taken from the site for re-use, possibly for the lower summer house. The remains of what we call the ‘lower summerhouse’ is situated on a path that originally led from the woodland to the castle gardens, via a gateway in the castle perimeter wall. This path was cleared and re-laid with the very welcome help of a group of volunteers from Rolls-Royce in 2007. The path runs in front of the building, and would have commanded splendid views over the eastern part of the Ruperra Estate and the countryside beyond. The path exits the woodland onto the drive at the back of the castle, directly opposite a wooden door into the castle grounds and next to a little rectangular building set in the wall. The lower summerhouse was obviously intended as a less arduously achieved pleasure place for the family at the castle than was the upper summerhouse. After careful clearance and conservation work, the remains of this small summerhouse today consist of the remains of the pretty cobbled floor. This extended in squared patterns beyond the covered area of the building, and had slabs of stone inset for wooden pillars to support the roof – whether tiled or thatched is not yet determined. The front of the building was open and is a good example of the ‘rustic’ style of Georgian garden design. Behind the summerhouse is a large area of attractive rock, reaching up to the southern escarpment of the motte and possibly enhanced by landscape designers to illustrate the ‘picturesque‘ style. The ruins of this building show that it was constructed in the late 18th / early 19th century of bricks similar to those used originally to build the castle and very probably made of local iron-rich clay. Originally there were wooden slats or timbers set into the bricks to support panelling and seating inside the structure. When the wood rotted, they were replaced at a later date by yellow engineering bricks. Iron nails found at the back of the building indicate that the outside also was covered with wooden panelling. The natural history of Coed Craig Ruperra is also very important. It is an Ancient Woodland Site (AWS), which means it has existed at least since 1600 when records were first made of such woods. Its links with Ruperra Castle are not in question, but it would of course have a much longer history of use by man, for protection and produce. For example, we know that it was a coppiced woodland, where hazel would have been grown on regular harvesting cycles to provide fuel and various wood products for the owners. In the early 20th century, it was still a native broadleaf woodland, but after the Great War it was largely clear-felled, like so many other woods, and replanted with conifers as a cash crop. Timber was in short supply and fast-growing non-native conifers were the obvious answer to the restocking problem. Only the exotic plantings above the Castle remained, and the conifer crop was left to grow to maturity, being supplemented with later plantings and partly clear-felled in the 1990s, after which it was put up for sale. The conifer plantings on ancient woodland made this a Planted Ancient Woodland Site (PAWS) and the Trust is working to restore it to AWS wherever possible, while paying due regard to the importance of the historic garden element on the southern slopes.